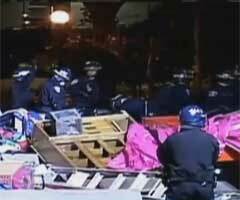 SFPD raided the Occupy SF encampment in the early morning hours, arresting at least 70 demonstrators. According to reports from Occupy SF, bicycles, books from the library, tents and other belongings were thrown into trash trucks, and several occupiers were arrested while they were trying to leave. This latest raid follows last week's police operations against Occupy LA and Occupy Philadelphia, and are part of a nationally coordinated assault on free speech rights and basic civil liberties aimed at putting the brakes on the movement of the 99%. We must mobilize now to defend the Occupy movement. We will not be silenced. Join us at the emergency rallies at 12 noon at 101 Market St. and at 6pm next to Justin Herman Plaza.